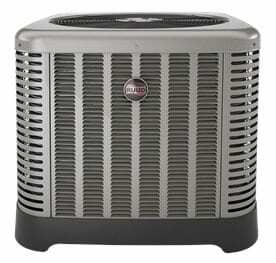 Finding the best brand for your home air conditioner can be a challenge. First it’s hard to narrow down which ones are worthwhile. Then when you find the brands you’re interested in, it can be hard to get the details. For reliability and name-recognition, Ruud is hard to beat. We’ll break down everything you could want to know (and more) so you can feel comfortable picking the Ruud product that works best for you. In a nutshell, Ruud produces low-cost, high-efficiency air conditioners. They offer both an “Achiever Series” and an “Ultra Series,” but all their models are very durable and have good SEER ratings. All their models offer features for quieter operation, and ratings from 13 to 20 SEER. Part of what makes Ruud’s AC units so reliable is the fact that they all use scroll-style compressors. Scroll compressors offer less drag on the refrigerant than standard compressors. This makes them more powerful and more efficient. 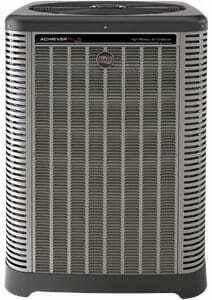 The overall quality of Ruud’s AC units is excellent when installed properly. Customers report long-lasting satisfaction. Part of the appeal of Ruud is that their units at any level often undercut their competitors. For example, their 14 SEER introductory unit is nearly $500 lower in cost compared to Ruud’s leading competitor’s offerings, like Goodman. The range of cost in Ruud’s units range from just over $900 (for the Achiever RA13) to just under $2,000 (the Ultra UA20) for the units themselves. This is without any installation fees. Ruud offers a wide range of variations and features for each model, meaning Ruud will have the perfect AC for the needs of any building. Based on your Manual J calculation, Ruud’s units range from 1.5 to 5 tons. And each unit has unique features. For example the highest tier offering, the Ultra UA20, has a variable-speed compressor and EcoNet capabilities. Ruud’s EcoNet system is a great feature. It combines smart controls on both wall-mounted stations and a phone app. The EcoNet system analyzes your usage data to create a more efficient usage profile. 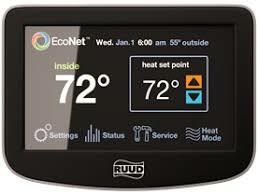 It allows for customizable controls and automation of your entire home heating & cooling system. Ruud offers an extended warranty plan covering mechanical and electrical failures. This means the compressor and heat exchange, two components with limited lifetimes, are covered for as much as 10 years. And the coverage includes labor related to these repairs, as well. It is worth noting that coverage at this level will incur an extra cost, though they do have a no-cost limited warranty as well. When looking at Ruud’s products you might see similarities between Ruud and Rheem. This is because they are manufactured by the same company. While Ruud is an excellent company, user reviews do reveal a few drawbacks. Customers who reported issues with their Ruud devices often reported them not long after installation. Many reviews indicated that any issues began within the first 6-12 months. It’s also often the case that the issues were mechanical from improper installation. So we would recommend, as always, to do your homework on your HVAC tech before you get your system installed! The other thing that I see brought up often is dissatisfaction with Ruud’s customer service. Some reviews indicate that Ruud’s service reps can be rude. Reps often shift the blame away from the company and onto the HVAC techs that installed the systems. These complaints were especially true in cases where people had early-on malfunctions. The RA13 is a 13-15.5 SEER unit with a scroll compressor and a composite base pan, meaning it operates quietly. The unit itself is designed to be both aesthetically pleasing, and sturdy. Its louvered design allows maximum airflow while protecting sensitive parts, like the compressor. It has many design features, including wide valve spaces and diagnostic windows, meant to make repairs a breeze. The unit is available in several tonnages and is the most basic model offered by Ruud. The RA14**W is a 14-16 SEER model. It also has a scroll compressor and composite base fan for quiet operation. One thing that sets this model apart is that it is actually optimized for houses in the Southwestern US region. It can handle higher temperatures and larger temperature differentials. Like the RA13, it has several features for ease-of-access. It has an attractive design with a protective powder coat which adds a level of durability to this unit. The RA14 is very similar to the RA14**W, with the exception that it is not optimized for a specific region. Like the other models in the Achiever series, it has expanded ease-of-access features, an attractive design, protective powder coat, a scroll compressor, and a quiet composite base pan. The RA16 is the most powerful basic unit in the Achiever line. It is a 16-SEER unit, offering the highest efficiency rating with similar features compared to the other Achiever series units. It has the high-quality scroll compressor, quiet composite base pan, expanded ease-of-access features, and an overall pleasant design. The UA17 is still in the Achiever series. As its model number suggests, it combines the best of both the Achiever and Ultra series. It is a 17 SEER unit. Like other Achiever series models it has a sleek design, quiet composite base pan, expanded ease-of-access features, and powder coat. Where it differs is in its two-stage scroll compressor. The two stages allow for accurate temperature controls and better efficiency. This is also the first unit with EcoNet features, meaning it is smart-control capable. The UA20 is the highest efficiency unit that Ruud offers, and a big departure from the Achiever Series. Ruud states that this unit operates at a minimum of 20 SEER. It has more ease-of-access features than the Achiever units for easy repairs. It also has a modulating Copeland Scroll compressor which maximizes efficiency and control, with a maximum load of 107ºf. EcoNet features make the UA20 the most customizable, efficient model Ruud offers. Having a new AC unit installed can be prohibitively costly, but it doesn’t have to be. There are a few things to keep in mind to keep costs down when it comes time for a new AC unit. But, before we talk about keeping costs down, let’s talk quality & value. It may be tempting to go for the lowest installation cost, the cheapest unit, and no extra features to shave dollars off the budget. But saving that money upfront won’t really be a savings if your HVAC tech does a bad job installing the system or if you realize you passed up on a long-term energy-saving feature. The important thing to remember is that you’re looking for the best value in your AC installation. The cheapest install is not always the best value! The best value is getting a good, fair price for on the highest quality unit & labor. The first thing to consider is that, realistically, the installation cost on your new Ruud unit could cost as much as the unit itself. When looking at HVAC techs, make sure you’re going for a good company with excellent reviews. This may mean a bit more out-of-pocket upfront, but having your system installed right is worth it. In my experience with Ruud products, many of the reported issues come from improper installation – something that isn’t covered under Ruud’s warranty. Spending a bit more on a good HVAC tech could potentially save you a huge headache down the road. The government currently offers tax credits for installing high-efficiency units. So look into those programs as well. And another thing to think about is having your installation done in the “off-season” - winter. Few people think ahead to the summer heat when they’re still freezing their toes off. Many contractors and companies will offer reduced rates on AC units and labor in the winter to boost sales during low-volume months. Ruud began its history in 1890 with a patent filed by Edwin Ruud for a unique style of gas water heater. Ruud began the Ruud Manufacturing company to design and expand on his water heaters. Ruud’s original intent was to come up with a water heater that could maintain constant temperature at all times – no small feat pre-1900’s. Over the course of Edwin Ruud’s life he helped pave the way for several new types of home and industrial water heaters. After his death the company expanded into heating and air conditioning equipment. 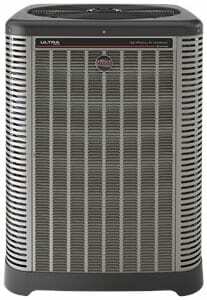 In 1959 it was purchased by Rheem Manufacturing. Today Ruud continues to develop water heaters for homes, pool and spa products as well as its well-known air conditioning line. Ruud has established themselves as a high-quality company creating good units at a great price point. With this primer on the company, you should feel comfortable deciding whether Ruud is right for your air conditioning needs. Even comparing Ruud to other AC companies, you’ll find it hard to beat the value this company brings.